Chris Quick has been an English teacher and boys cross-country coach at Palatine High School for nearly 18 years. 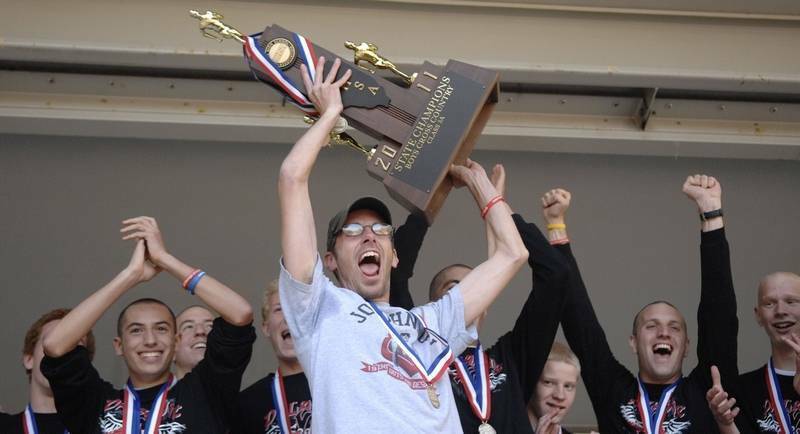 As a coach, he has trained hundreds of runners to meet their greatest potential, coaching teams to the IHSA state podium many times, including Palatine’s legendary 2011 state champion team. As a teacher, he has taught a multitude of AP students the skills required for high-level composition, as well as a wide variety of students about the power of music through his Rhetoric of Music classes. An outspoken lover of the arts, Quick’s knowledge of film, music, and other media is nearly encyclopedic. I sat down with him to discuss his five favorite films, the pressures of being an AP student, and what the accumulation of power means in today’s world. I have all kinds of movies that I love, but if I had to pick, my parameter is probably the movies that I want to watch over and over again. The first one is ​The Graduate​, and I relate to that movie on such a deep level. First of all, he was an honors student and cross-country runner, the main character, and he was just so lost and not wanting to get stuck into some superficial, weak, day-to-day existence, and he didn’t know what he wanted, he just knew what he didn’t want, and that, to me, captured a good five to ten years of my life. And I just didn’t really know what I wanted from when I was 15 to 25. Every time I need some clarity, I watch that movie over again. And it has a killer soundtrack, Simon and Garfunkel soundtrack, all kinds of great shots. Just an incredible movie. SP: Going back to ​The Graduate,​ you’re a cross-country coach and AP English teacher. Have you ever seen a reflection of Dustin Hoffman’s character from ​The Graduate​ in your runners or students? CQ: Honestly, I see a reflection of him more in my AP students. My favorite shot in ​The Graduate​ comes when he’s living with is kind of sold-out, bozo parents in California and he can’t relate to them at all, which is that whole, 40s and 50s generation not being able to relate to the 60s generation, which anybody can relate to in the sense that your parents’ generation, you’re just never gonna relate to, so there’s this scene where, for his birthday, his parents get him this scuba gear, which he’s never indicated any interest in. There’s this great shot of him walking out and he has the goggles on and you can hear him breathing, but you can’t hear anything his parents are saying, even though they’re screaming all kinds of inane stuff for his birthday, and he dives into the pool in the backyard and the shot just ends with him standing at the bottom of the swimming pool while a barbecue happens above him. The movie starts where there’s this party honoring him for doing so well in college and he’s won some prestigious award and he’s got good grades, but he knows its all meaningless because everyone else is just reveling in his potential, and they make his potential a marketable thing to show what good parents they are. I think my Advanced Placement kids are under a lot of similar pressure to do something that’s worthy of their intelligence. SP: Wes Anderson’s ​Rushmore​ has a sort of reverse of that scene happen, with that disconnect between generations where Bill Murray’s character is at his son’s’ birthday party and he just jumps off a diving board and sits at the bottom of the pool, getting away from the younger generation above. CQ: I like the latter half Bill Murray’s career because I can relate to this kind of fish out of water alienation of older people that I feel almost every single day. I always find myself in the nexus of the scene where he goes off the diving board or even his entire character in ​Lost In Translation​, which is debatably also close to being on this list. My number two, and I love movies about politics and power, would be ​All the President’s Men​, which makes me seem like the biggest Dustin Hoffman fan ever, but I was obsessed with people bringing truth to power. Things, whether corporate or governance, that are oppressive to the people and the good guys investigating that. It’s got all these incredible shots of the two of them walking down sidewalks and there are these massive government buildings behind them to show the depth of their task and what they’re up against, which is all in the cinematography. SP: With ​All The Presidents Men​ and ​The Social Network​ (see below), there’s definitely a correlation there between those two about the abuse of power. Are there any other movies you find reflect that abuse the same, or do you think those two are the best encapsulation of that phenomenon? CQ: I can’t think of it off the top of my head, but obviously the drama of potential abuse of power is playing out in the news right now. A lot of my pose toward power and bureaucracy is very cynical, and I think that I very much fear the making of money as the road to happiness and goodness in one’s life. And I feel like the current administration especially is willing to loosen regulations to make money, and I just really distrust that, so I’m really interested in movies that uphold avatars of that kind of anti-corporate agenda, not in the sense that corporations are always evil, but in the sense that the seeking of money as the be-all, end-all of what a life should be is something that I reject. So there’s definitely lots of movies like that, with these singular people fighting entrenched power, and I’m drawn to that story because I feel like its a micro-battle I want to be fighting as a human. Probably my favorite movie of all time is ​Animal House​, which I know isn’t a very PC thing to have be your favorite movie, but I don’t care. My wife and I counted once that we have over 50 lines from Animal House that we use in our day-to-day life, so it’s literally a part of the language of my life. It’s John Belushi’s best role ever, John Landis directed it, and he directed all kinds of funny stuff in the 70s and 80s; he directed the Thriller Video, he directed ​Blues Brothers​, just so much great stuff. The fourth one is ​The Social Network,​ which again is a movie about power and what happens when all of a sudden, a normal person acquires an inordinate amount of money and power. It’s got a killer soundtrack by Trent Reznor and Atticus Ross that won an Oscar for best soundtrack, and I really liked everybody in there. They were all kind of unknowns, like Andrew Garfield plays Eduardo Saverin, and that’s his first movie before he became famous as Spider-Man, and Jesse Eisenberg had been sort of known, but it was definitely a breakout role. It’s just so well written, and it makes you want to know, if you were ever tempted with money and power, who would you become? SP: One of the first trailers for ​The Social Network​ was actually set to Power by Kanye West, and I thought that was such a perfect choice. It literally gives you goosebumps because it’s in the background of all these images of people plunging into insanity derived from their power, and its just such a chilling trailer altogether. CQ: Yeah, just look at how his story’s played out in real time. Their loose restrictions on what kind of content gets in the newsfeed may have altered the last election. I mean, Zuckerberg has made a lot of dubious ethical decisions with the power that he has. Even Google, whose motto is supposedly “do no harm,” and they want to be avatars of the good guy, but when you have billions of dollars at stake and profit motive and stockholders, it’s hard to uphold that prerogative, which is why I don’t want to work a corporate job. Even with my annual Distance Night meet, there’s this moment in ​The Social Network​ where Eduardo is trying to get him [Zuckerberg] to put advertising on the site, and Zuckerberg’s like “We don’t even know what it is yet. We just know that it’s cool,” and with Distance Night, the number one line I thought of when we created Distance Night was I don’t want to make money, I just want it to be cool; I wanted to make it the kind of track meet that I’d want to go to, and once we get that going, we can figure out a way to commodifying it if we need to. Honestly, for the fifth one, I could pick almost any Richard Linklater movie because he’s my favorite director, so whether that’s ​Dazed and Confused,​ or ​Boyhood,​ or any of his work. But honestly, I’d probably have to pick ​Before Sunrise​, or the whole ​Before​ Trilogy, just because it follows this one couple through multiple iterations of their life and drops in on them every ten years so you get to see a little window into what somebody’s intimate family life is, and then you can trust that there’s hopefully going to be another one around the corner. The reason I like Linklater so much is because of this great interview I saw with him where he said that his organizing principle for movies is never plot, which I think is really, really interesting, because most people want to follow a narrative arc in a story, and he said that his central organizing device is always to play with time in some way, like in ​Boyhood​ where he’s literally dropping in on the same cast every year for 13 or 14 years, and the idea that he got that movie funded is crazy.